A year ago, you swore you’d never buy into the hype. Wearable tech was for geeks. And you, a normal, well-adjusted consumer, would do just fine with your laptop and smartphone, thank you very much. But then something happened. Maybe it was the neighbor who lost 30 pounds with a Fitbit, the thirteenth commercial about the Apple Watch, or the new hire who used a Moto 360 to flip through a presentation deck. All at once, you couldn’t remember why you’d ever doubted. It was time for a wearable device—the only question was which one. Unfortunately, the choice between a smartwatch and fitness tracker is harder than it looks. Sure, smartwatches can tell time, but you’ll spend many more minutes checking apps and monitoring notifications. And yes, the fitness tracker might seem all about workouts, but the most recent models can measure a whole lot more, including health signals and sleep quality. With that in mind, here are the six key questions to ask yourself before you purchase one or the other. When it comes down to it, a smartwatch is a fashion statement first, and a tool second. 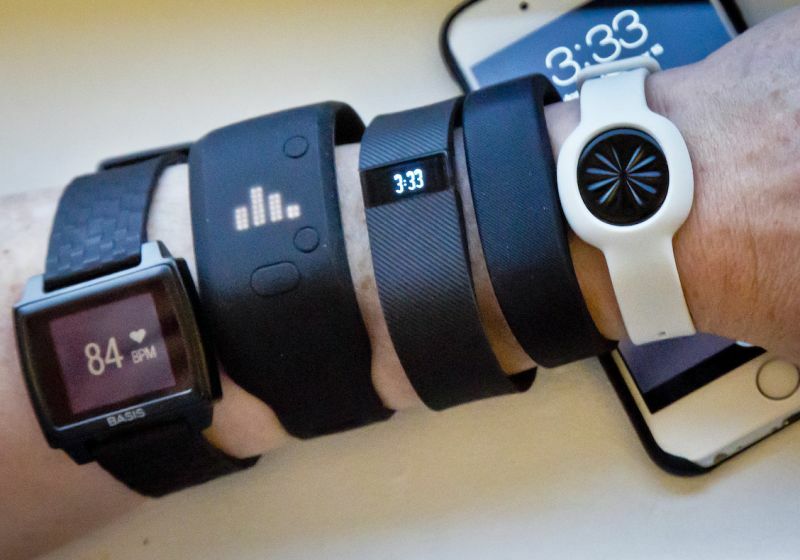 For fitness trackers, it’s the opposite. The key is deciding which of the two is more important to you. Before you buy a smartwatch, make sure you’re drawn to the way it looks, whether it’s the geeky charm of the Pebble Time, the sleek simplicity of the Moto 360, or the classic face of the LG G Watch R. It’s unlikely you’ll fall in love with any one feature on today’s smartwatches, but if you simply love how it looks in the mirror, you’ll be happy you made the purchase. Meanwhile, fitness trackers aren’t just ambivalent about fashion—most want you to forget they’re there in the first place. Whether you’re wearing an understated band or abdomen patch, the tracker’s job is simply to transmit all your info quietly and seamlessly—not to stand out at the company lunch or family barbecue. It’s about data, not design. As a general rule, fitness trackers are cheaper than smartwatches. You can snap up a top-shelf tracker for about $100, while most of the popular smartwatches will start closer to $200—more if you want the best models. Then again, you tend to get what you pay for. The most expensive smartwatches come with several fitness-tracking features built in, meaning you get everything—the heart rate monitoring, the notifications, the apps—all in one device. Think of the smartwatch as a pricey luxury: a full-featured wearable with more settings and alerts than you’ll need. In contrast, the fitness tracker is an affordable compromise: a streamlined wearable with just enough features to do its job. 3. Casually Fit or Seriously Ripped? While the smartwatch tends to out-feature the fitness tracker, there’s one category where the tracker still wins. Naturally, that’s fitness. Both devices monitor simple stats like steps and (in most cases) heart rate, but the fitness tracker tends to provide more detailed metrics, more extensive reports and more granular goal setting. As such, the smartwatch is a good choice for the casually recreational person—someone who wants to stay active, but who isn’t necessarily counting calories to the decimal place. Meanwhile, professional athletes and serious bodybuilders might opt for the tracker, which keeps the focus squarely on athletic performance and fine-tuned physical goals. 4. Behind the Scenes or In Your Face? The smartwatch is meant to be seen, admired and shared. It’s why Apple sells brightly colored watch bands for workouts alongside stainless steel link bracelets for dinner parties. It’s why the device will vibrate, chime and flash to get your attention throughout the day. Meanwhile, most fitness trackers won’t even bother making a sound. They’ll sit silently on your wrist, hidden under your shirt, or clipped on the edge of your pocket. If you relish the fanfare of making calls through a wearable device, grab a smartwatch. If you’d rather people not even know that you’re wearing a gadget, get a tracker. 5. Wear Anywhere or Wrist-only? The smartwatch, quite simply, is made for your wrist. Compare that to the fitness tracker, which boasts at least nine different types of wear, depending on your device of choice: wristband, clip, chest strap, anklebone, headband, headphone, insole, leg strap or mouth guard. If you prefer wearing on your wrist, this question won’t make the decision any easier. But if you’d rather leave your arms free of tracking devices, consider an alternative-style tracker. 6. Display Quality or Battery Life? Most smartwatches feature some kind of modestly sized, graphic display, while fitness trackers will give you a few dots or numbers at most. All those shiny pixels on the watches come with a cost, however, and that’s battery life. Many trackers can last a week or more on a single charge, while with smartwatches you’ll be lucky to go two days between plugging in. So it comes down to what’s more important: the convenience of staying unplugged or the eye-candy of a pretty display. If you’re still undecided, consider getting both. You’ll get all the advanced tracking of the fitness band, next to the class and design-first aesthetic of the smartwatch. You’ll also get twice the positive reinforcement after a run or workout. Just remember: you still only get to count burned calories once.